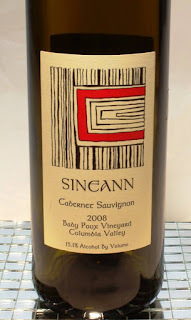 I went into the racks today to see which wine might be needed to be enjoyed now, selected and tasted a 2008 Sineann Wines Cabernet Sauvignon from their Baby Poux Vineyard in the Columbia Valley AVA(Oregon). Oregon is what I often think of when I’m thinking of Pinot Noir, and – o.k. – maybe Pinot Gris. Cabernet Sauvignon, for me, is left bank Bordeaux blends, Sonoma or Napa Valley. 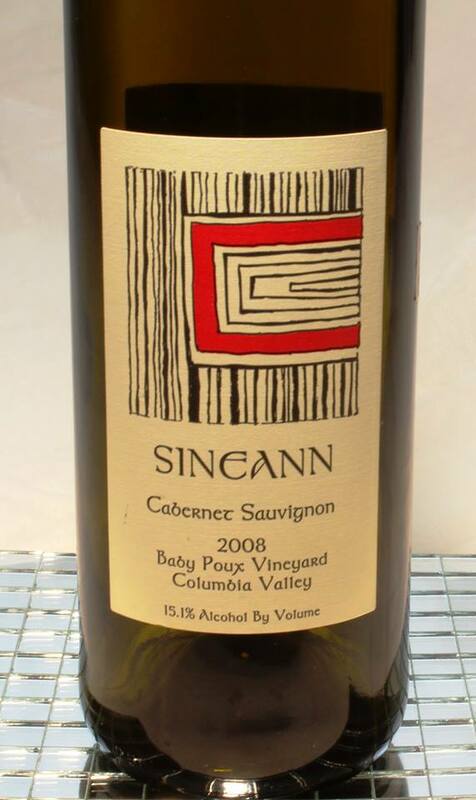 A good vintage (97 points Wine Spectator), it’s unlikely you will find a 2008 on the shelves now, but 2012 (at 95 points) and 2013 (at 91-94) should be available and worth looking into from Sineann. Deep purple in the glass with a nose of plum, cassis and blackberry that jumps from the glass. Flavors of plum, cola, blackberry, and cassis are well integrated in a full bodied wine that finishes with a razor’s edge of crispness in a wondrous contradiction of flavors that not only linger cleanly but develop. Sage and cinnamon end notes. Aired more and tasted on the second day, mashed blackberry dominates the nose. Flint and pencil lead develop in the taste that still leads with blackberry. Tannins are silky and the wine is creamy smooth. A most interesting and enjoyable Cabernet Sauvignon. Offered a taste to someone who generally does not like structured wines and she loved it. Thumbs up on this one! Like Wine Mizer on FaceBook for reviews, fun facts, recipes and industry news.